Heroes can be blinded with revenge. For example, Conan himself was blinded by ideals of revenge when in the 1982 he seeks out the movie version of Thulsa Doom and in 2011, he seeks out Khalar Zym. Reasons for revenge usually sound noble like avenging the death of a best friend, a parent, a comrade, etc. until they realize if they carry out their plans of revenge, it makes them the same level as the villain and they are harming those they care about. They say, "I won't take revenge, I won't stoop down to your level." type of talk. Count Egobossler in Gatchaman Fighter unlike his Jetman counterpart Radiguet had reasons for going insane. Some villains become villains because of their obsession with revenge. Egobossler was once known as Erun who was the illegitimate son of a count, he later realized that the cruel man was his father. After seeing his mother's death, he goes from bad to worse. He kills his own father, tortures his own half-brother for fun just to show the world how angry he is. This made him the most cruel villain ever conceived by Tatsunoko. The cycle of revenge should be emphasized. 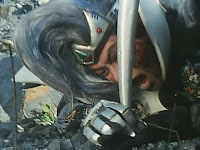 Like in Jetman, Tran becomes Tranza to get revenge on his fellow Vyram who bullied and mistreated him. He goes on to become Tranza, mistreats them without mercy stooping down to their level. This of course just didn't go well since Radiguet did backfire at him, causing him to be admitted in a mental facility where he just thinks, "Was it worth it?" And then we know Radiguet gets his just desserts eventually.